Frequently found in grocery store freezer cases, Cornish game hens seem to be more exotic than they are. In reality, they’re just miniature chickens (sure to impress all the women out there who think everything smaller than normal is cute; I’m looking at you Angela). This was the first time that I had ever had one. I had seen them numerous times in the freezer ghetto of the grocery store but had passed them by as being unfamiliar and possibly too much trouble for the benefit. I only deigned to buy one (well, two really as they come frozen in two packs) when they were on sale. And they promptly went into the freezer for longer than I want to admit. Why did I choose to rescue them from their frozen entombment? Mainly I wanted to reclaim some freezer space. My first step after defrosting them is to figure out what to do with them. Unfortunately, despite my collection of cookbooks (which is either minimally sized or overly-large depending on which family member you ask), I was unable to find a recipe that really attracted me (or that I had all the ingredients for). So I decided to improvise. With a little bit of Gourmet and a little bit of Alton Brown as well as just general ideas, i think it turned out pretty well. 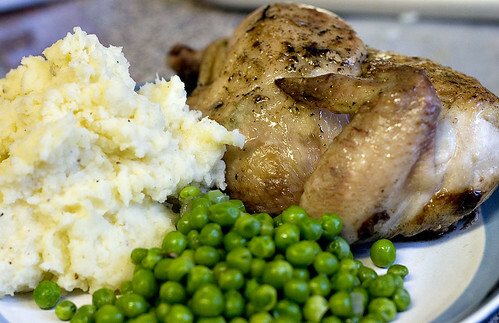 For a family of two, there are a number of advantage to the Cornish game hen: namely, one is enough food for two people (with a little left over to spoil our cats with). But, what really surprised me, was that it was good. The breast meat was moist and the thighs were tender. And, I should add, that this was without brining or pre-salting or any other extraordinary effort (or preparation as it’s normally called); from a frozen mass-produced bird. I think, that in our household at least, Cornish game hens will become frequent visitors. I bet our cats will like that. Preheat the oven to 400ºF. Place two cast-iron frying pans into the oven. Spatchcock the game hen (cut out the backbone so the the game hen lays flat). Mix together the butter, thyme, and garlic to create an herb butter. Season it with salt and pepper. 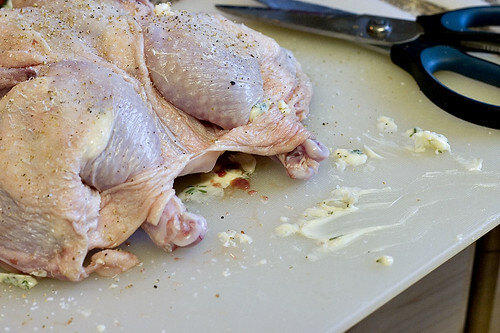 Rub the herb butter under the game hen skin on the breast and thighs. Rub the remaining herb butter onto the outside of the game hen. Season the game hen with additional salt and pepper. When the frying pans are hot, remove the frying pans from the oven. 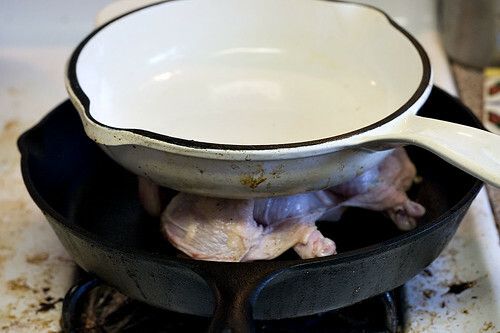 Place the game hen skin side up in one of the frying pans. Place the other frying pan on top of the game hen helping to flatten it. Return the frying pans with the game hen into the oven. Cook the game hen until its internal temperature reaches 160ºF about 25 minutes. Remove the frying pans from the oven. Remove the game hen from the frying pans and set aside, covered with aluminum foil. In the bottom frying pan, add the shallots and cook over medium heat about 1 minute. Deglaze the pan with the chicken stock, scrapping up any browned bits. Bring to a boil and reduce until the sauce is thickened. Remove the aluminum foil and cut the game hen in half laterally. Serve each half with the sauce poured over it. Sounds delish! I’d love to try making one sometime, if I can ever plan enough ahead to allow for thawing. I end up having the same problem with defrosting (hence why I won’t admit how long they’ve been in the freezer). I usually just force myself to take them out of the freezer at some point and eat them later in the week after they’ve thawed.